Sometimes it’s hard to keep track of your PD. Here are two tools that can help you do that. With 23,500 full-time and 15,000 part-time staff, Fairfax County (VA) Public Schools found it extremely challenging to keep track of the professional learning the district encourages employees to do. They chose Truenorthlogic (truenorthlogic.com) to build a professional learning platform with a single sign-on. Now teachers and administrators can log on to access, rate, and track learning opportunities. Grossmont Union (CA) High School District wanted to ensure that everything they did was the most effective thing they could do at a given time. BrightBytes’ Clarity research and analytics platform (brightbytes.net) made this possible. By using data to assess their greatest needs across all of their schools, Grossmont was able to deliver the right professional learning opportunities at the right time for its staff. Thanks to Clarity’s research-based data tools, the district is able to measure the impact of its PD using longitudinal analysis. When the administrators at Portola Valley (CA) School District asked their teachers to form professional learning communities, they wanted to be sure everyone had a common understanding—so they flipped the PD. 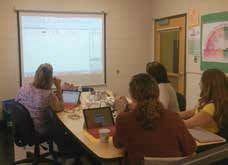 Teachers watched videos on Teaching Channel for background information, which saved time when they met during prep time. “They hit the ground running, with an understanding of what PLCs are,” says Superintendent Lisa M. Gonzales. In addition, teachers spent about two hours journaling and making planning guides on their iPads or in Google Docs to bring to their teams so they’d be able to discuss the PLC challenges more fully. In the past, teachers were doing PLCs as study groups. One group studied STEM; another looked at single-gender classrooms. “We realized PLCs are most meaningful when they’re focused on using data and increasing achievement,” says Gonzales. She says flipping PD and front-loading as much preparation as possible before meeting in person has helped to make the PLCs much more successful. Whether teachers take an online questionnaire, watch videos or clips, or just read articles, preparation moves the needle more quickly. Each year, Rachel Langenhorst, technology integrationist and instructional coach at Rock Valley (IA) Community School District, lays out her district’s PD plan for the year well in advance so she can see what she wants her teachers to accomplish. She and her team of instructional coaches and administrators get together in early July to establish goals and develop a road map to get to them. “We always tweak and change how it’s delivered, but the content is set in stone,” says Langenhorst. When Rock Valley went 1:1, the teachers were in different places of preparedness. To provide PD that was meaningful for each teacher, Langenhorst had to start fresh. She and her team created an “unconference,” called Rocket University, as a way for teachers to share their skill sets and tap into each other’s knowledge. Now, twice a year, teachers sign up for what they want to learn and they attend 30-to 45-minute sessions around the school, taught by their colleagues. “When you give teachers choice, they’re a lot more [in] vested,” says Langenhorst. Teachers sign up for the classes they need at Rock Valley CSD’s twice-yearly Rocket U. “Rocket U lets them have a say in what they want to learn.” The sessions are small and manageable, with deep conversations. Sessions might introduce and play with a new Web tool or do a book study. In addition, Langenhorst has invited medical professionals this year to discuss the behavioral and medical needs of students with diabetes so teachers can work with them more effectively. For more tips from Langenhorst, check out her interview on edWeb (http://home.edweb. net/host-pd-buffet-teachers/).